As Talking Dogs Scentwork Accredited Trainers, we are delighted to be hosting TALKING DOGS SCENTWORK® Workshops. See below for 2018 workshop dates. We will be announcing 2019 workshop dates soon. Please read about the exciting world of Talking Dogs Scentwork® & the full range of workshops below……………. Talking Dogs Scentwork® offers a great way to have fun with your dog and tire him or her out quickly. This can be done at different levels, from letting them work alone while you watch from the sofa to you both being actively involved covering larger, more challenging areas. Scentwork is about teaching the dog to find a specific scent, not a specific item. The scent is the key. This form of scentwork is different to that used for obedience and working trials, search and rescue and tracking. Each employs it’s own style and method of training which best fits the task in hand. Talking Dogs Scentwork® incorporates all those styles and is based on the type of searching used in drug detection handling. The free flowing search style allows the dog to cover complex areas efficiently and effectively. The handler actively works to support the dog and ensure the whole area has been cleared. Unlike some other forms of scentwork, the handler is an integral part of the search not simply an observer from the sidelines. TDS is suitable for all breeds and ages of dogs & is an excellent way to connect with your dog, building trust and concentration. Each dog works to his or her own ability, according to what the individual dog needs. And of course, it’s FUN! Search techniques can provide great help both with daily training and with some behavioural issues. From improving recalls to learning to cope with traffic, scentwork is an adaptable, effective tool to add to your skill set. 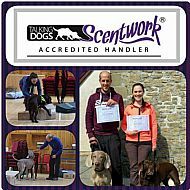 Handlers who have completed workshops 1-5 can apply for Workshop 6 which will be the Test Day for Handlers to become a Talking Dogs Scentwork® Accredited Handler. This is your introduction to scentwork where you and your dog learn the basics. Your dog will be introduced to a specific scent and will be encouraged to give an active indication (dog plays with the scented article or eats the food find, rather than going still and staring, or sitting in front of it). Passive indication will not be taught at this workshop. You will learn about the scent picture, basic handling skills and conducting free searches. There are no pre-requisites for dogs or handlers attending this workshop, all are welcome. Scent 2 concentrates on handling skills - introducing directed searches and search patterns. These skills allow teams to increase the challenge of the searches, including changes of height, duration of search and multiple/zero finds. Building on the foundation searches, this day will push the boundaries and challenge your team. This workshop is open to all handlers who have completed Scent 1, or spectated at Scent 1 and then introduced the scent and active indication to their dog at home. Only active indications will be taught (ie. dog retrieves the scented article or eats the food find himself). This workshop is open to all handlers who have completed S2. This is all about searching in new environments, the closest you and your dog will get to the actual experience of operational detector dog work. Delegates must have attended a minimum of three Talking Dogs Scentwork® workshops before attending this workshop. Only 6 dog/handler teams will be accepted on to each Scent 4 workshop, so book early to avoid disappointment. This workshop is open to all handlers who have completed S1,2,3,4 & 5. Important notice: These workshops are not set up for teaching or working with passive indications (the dog sits, stares or stops at the find instead of retrieving it) and as such handlers wishing to work on a passive indication will not be able to work their dogs. Due to the extra time passive training takes up in the workshop, I’m afraid this rule must be enforced.